is the leading global broker in social Trading. in short their trading platform and your trading experience is a more entertaining and social event then you will find anywhere else. If you feel that it is time for you to start in investing and entering the trading world. You want also to start trading Bitcoin or gold or even coffee like other people you know that are making money or losing money with this but all are winners when they talk about it. It can be somewhat intimidating. All these graphs and indicators besides the other 100 things you need to know about . and this is even before you can think about actually trading for profit. they receive from us the name of” Etoro Bitcoin Broker “ simply because you don’t have to trade and can have other do it for you. The entire concept is that the masses know more than any trader by him or herself. so you get the numbers what the social trading trend is. at the same time there are very good traders out there. And you just need to find those traders ( can be as many as you want and can afford) and follow those traders… automatically with the amount you feel save to invest. This is a longer introduction then I would normally give to a broker but eToro is special and different, not just because it really is a top bitcoin broker in our eyes but eToro is the number one social investment network. They combine social media with financial trading and build a community trading concept. For traders that look to trade metatrader 4 , or metatrader 5 better go to another broker like Avatrade or HYCM as the platform that etoro offers kind feel somewhat game like , but that is the world of social media and now also the world of social Trading. The basic eToro trading platform is called eToro OpenBook and is a platform where you can join millions (around 3.5- 4.000.000 ) a huge social trading environment. 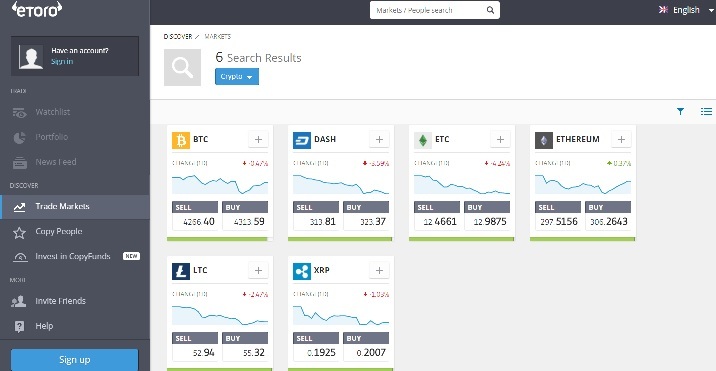 Etoro offers trading in Bitcoin and other crypto-currencies through their social trading Platform making it a top Bitcoin Broker among all brokers. copy trade bitcoin.